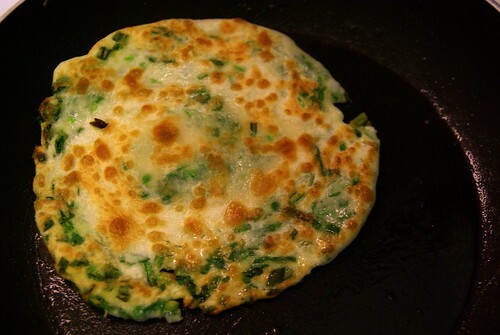 蔥油餅 (cong you bing) or green onion pancake was my latest experimentation with Chinese food. It has never ever been something we ate in our family, let alone made. I tried it for the first time in newer Chinese restaurants opened by Mainland Chinese, notably at a restaurant on St-Mathieu, formerly Ravioli du Manchuria, now Friendship House. 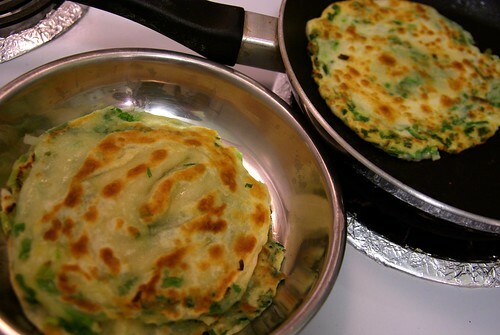 It takes two main ingredients to make cong you bing (so the pronunciation is more like “tsong you bing”), namely flour and green onions. You can substitute green onions for chives. In a mixing bowl, add salt for taste to two cups of flour. Then, mix in about one cup of boiling water. Apparently, it helps gelatinize the gluten in the flour for a better texture in the end. Knead the dough throughly for about 5-10 minutes. Coat with vegetable oil (and sesame oil for taste) and let it sit for an hour on the counter. 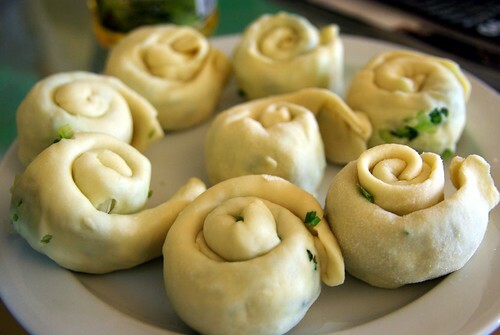 Once you have your dough, divide into eight pieces. 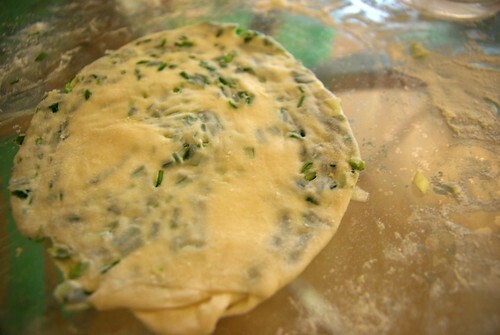 Flatten as much as you can and sprinkle with green onions, chives or the filling of your choice. I added too much of it and it overspilled. I figured that if I chopped my green onions more finely, it would’ve been ok. Roll like a cigar, and then roll again into a snail-like form. 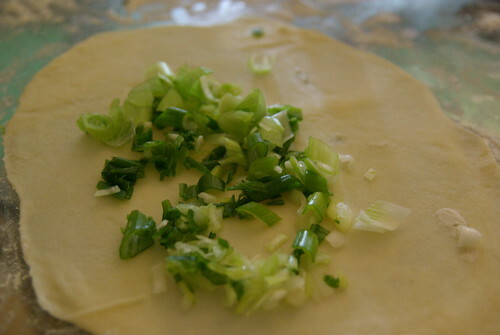 I understand that this step is to incorporate the green onions into the dough so that it cooks on the inside of the dough after pan-frying. It’s good with Chinese-style vinegar, soy sauce or hot sauce… whichever suits you! Took me about two hours to make, including all the waiting and the frying.